Nothing to do with dance, but something to do with writing… My short story “It Needs People” has been selected for White Rabbit’s regular Live Lit event hosted by ArtsAdmin called “Are You Sitting Comfortably?”. It’s an evening of “read aloud” stories – read by two actors, and apparently including “entrancing visuals, trippy literary competitions and prizes, and a FREE before-midnight feast of hallucinatory treats including poppy seed cakes, cheeses, and absinthe, all served with the faintest whiff of opium.” [Not sure those last two are actually true]. Each event has a particular theme: this one is on dreams. 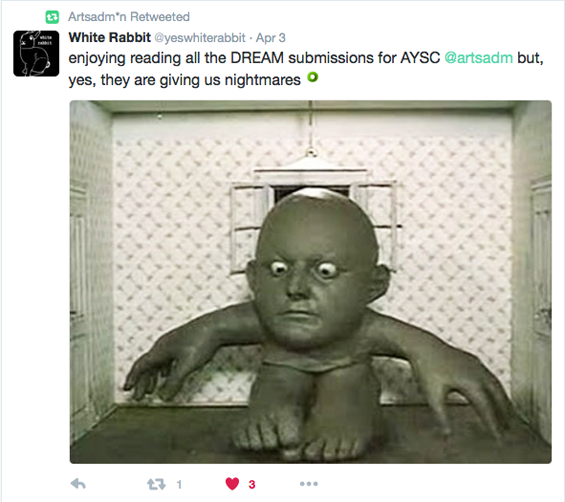 Here’s their tweet about it, with a frickin’ freaky photo! This event is on the is on Friday 15 April, from 7.30 onwards at Toynbee Studios, 28 Commercial Street, E1 6AB London, United Kingdom. Booking details here.